New Line Cinema, Peter Jackson and Weta Workshop return to Middle-earth with The Hobbit, released by Warner Bros. Weta Workshop contributed design, specialty props and specialty costumes to this epic trilogy. Wandering Middle-earth's winding paths is the travelling conjurer Gandalf, known by many names to many peoples in many lands, though few could guess the true extent of his powers or purpose. His fireworks may delight many a Hobbit youngster, but the Grey Wizard is no mere magician or trickster. Gandalf is old beyond reckoning and wise the reach of mortal men. Where Middle-earth's lords and kings brood over the fortunes of their realms, Gandalf's gaze is cast across a wider canvas and it is the greater good of all the world's free peoples that he is concerned with. Needless are none of the acts of the Wizard, so when he counsels Dwarf-king-in-exile Thorin Oakenshield to enlist the services of Mister Bilbo Baggins as a burglar in his quest to reclaim his birthright from the dragon Smaug, it is done with a keen insight into the sheltered Hobbit's qualities and an understanding of how crucial these will be to their success. The Hobbit impresses Thorin Oakenshield little upon their first meeting, but, despite his misgivings, the Dwarf knows enough of Gandalf to credit him with good reasoning, and indeed it will not be long before Bilbo Baggins' mettle is tested and the Wizard's wisdom proven. 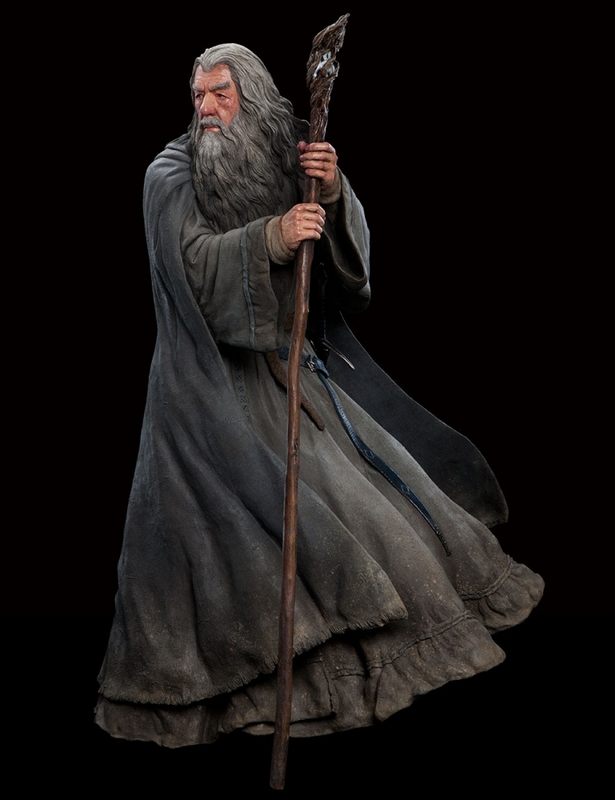 The Life Size Weta statue of Gandalf the Grey is a 6ft fibreglass statue in a similar pose to our 1:6 scale Gandalf the Grey statue. It was sculpted by Steven Saunders and created by the same artists at Weta Workshop who worked on The Hobbit: An Unexpected Journey. 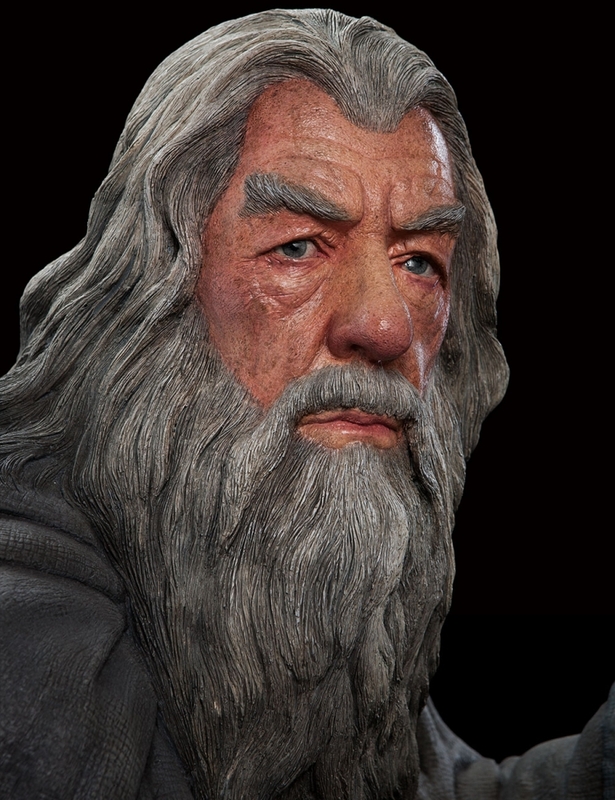 The price for Gandalf the Grey 1:1 scale is US$4,999 and will be charged in US Dollar currency. EUR and NZ$ prices are an indication only. The price excludes shipping, taxes and duties that may apply. To order or to get more information, please send an email to info@wetanz.co.nz. Please include your shipping address so that we can confirm the shipping cost to your address. Please note this must be a physical address. We will get back to you to confirm availability, freight costs and payment options. Your statue comes securely padded and enclosed in a metal cage, which in turn is inside a sturdy cardboard box. The whole package is secured to a freight pallet. For unpacking, we do recommend two people to carefully lift and carry the statue out of the cage, taking care not to damage the staff and other protrusions. Unpacking the statue requires simple tools (not included) to unfasten one of the bars on the cage. Freight costs will be confirmed and agreed with you before we proceed with your order. Any Import Duties and Taxes due are the responsibility of the Purchaser. Weta will advise from which of our warehouses the item will ship. As this is a made-to-order item, Weta Dollars are not available, nor can Weta Dollars be used to purchase it.